Panel discussion and book launch. IAN SMILLIE, Independent consultant and scholar. Chaired by CAROLYN MCASKIE, Senior Fellow, Graduate School of Public and International Affairs, University of Ottawa and former CIDA Vice-President and UN Assistant Secretary-General. 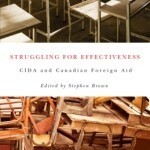 This event will mark the publication of Struggling for Effectiveness: CIDA and Canadian Foreign Aid, edited by Stephen Brown (McGill-Queen’s University Press). Presented by the Fragile States Research Network and the International Political Economy Network at CIPS. Free. In English with biligual discussion period. Registration is required. A light lunch will be offered after the panel discussion.